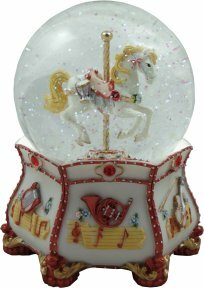 A delightful musical water globe adorned with musical instrument motifs with french horns, lyre harp & violins. The carousel horse is mounted inside the globe on a twisted brass rod whilst his podium is decorated with musical notation. The horse remains static in this water globe as the music plays. Shake to make the glitter inside the globe shimmer. Clockwork wound by turning a key underneath the water globe.